I've opened a new website entitled "Dentures - What I Talk About When I Talk About A Denture". Click the link to view. Dentures (http://thedenture.com/) is a website about Dentures, Prosthodontics and Dental Implants. It is a project I've planned to open since last year. The University of the East College of Dentistry continuing professional education in conjunction with the 64th Foundation Anniversary Celebration presented a Scientific Lecture on Dental Practice Management on September 22 2010. Dr. Steve Mark Gan lectured on "The Dental Economy in the Philippines: How to Extract Survival from the Root of the Financial Crisis"
Vote for PRODENT Candidates! Good governance, transparency, cost effective programs and service without political boundaries. 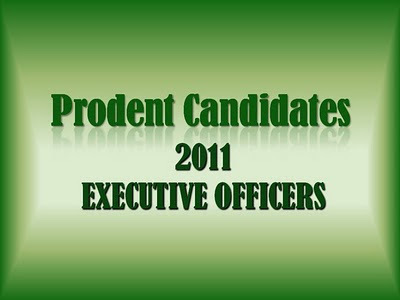 Election of PDA Officers will be held on October 22 2010, 102nd PDA Annual Convention SMX Convention Center Mall of Asia Oct 19 - 24 2010. The Philippine COllege of Oral and Maxillofacial Surgeons invites you to a Limited Attendance Symposium on Odontectomy on October 19 2010 1:00 to 5:00 PM at Function Room 2 SMX Center, SM MOA Pasay CIty. Pre is P400 while onsite is P500. For more info please call Dr. Jaime Aldecoa at 02 347 9967.